They were damn nervous. Even halfway through when asked if he wanted to talk about the song ‘Foundling’ from their most recent album that was getting its premiere tonight, Adrian McNally blurts “No, too nervous”. The ends were showing as the opening songs were tentative and even the orchestration a little too polite and understated. It took Rachel Unthank grabbing the vengeful ‘Blue Bleezing Blind Drunk’ by the short and curlies, giving it a full blooded performance to kick the show into the right gear. She threw out those lyrics like she had a a bottle of Bacardi Breezer in one hand and a B&H in the other. From the moment she literally punched out the last line “I’ll go and I’ll drown all my sorrows / But I wish I could drown Mickey too” it was onwards and upwards. 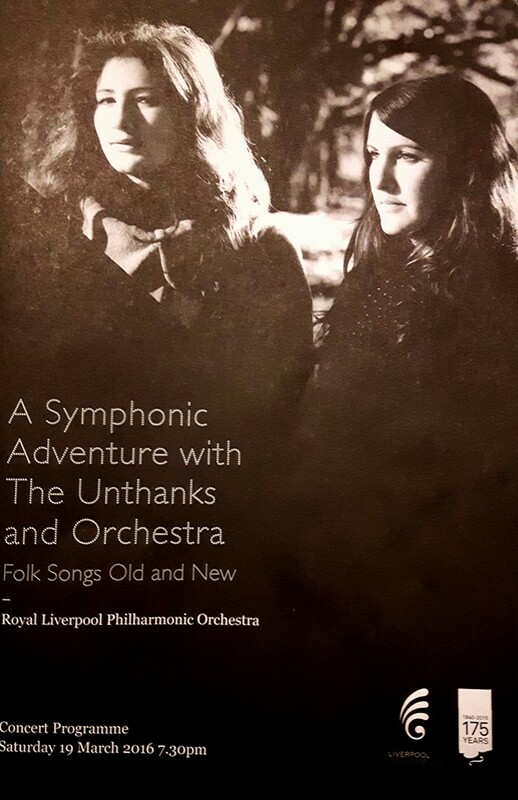 The interplay between the sisters on the aforementioned ‘Foundling’ playing the roles of abandoned child and desperate mother is deeply moving as the track unfurls slowly, the orchestra only increasing the melancholy and pathos. This wasn’t just some extra fiddles as a novelty, these were great arrangements and musical ideas being expressed in ways not possible in a live Unthanks show before. Robert Wyatt’s ‘Out Of The Blue’ again bristles with energy and passion as Rachel repeats the “You’ve planted all your everlasting hatred in my heart” refrain.